As do most scrapbooks, Sarah Eva Howe's contain bits and pieces that reveal more about her interests. Today we'll look at a few of those random gems – all of them related to music and its importance to the extended Howe family. 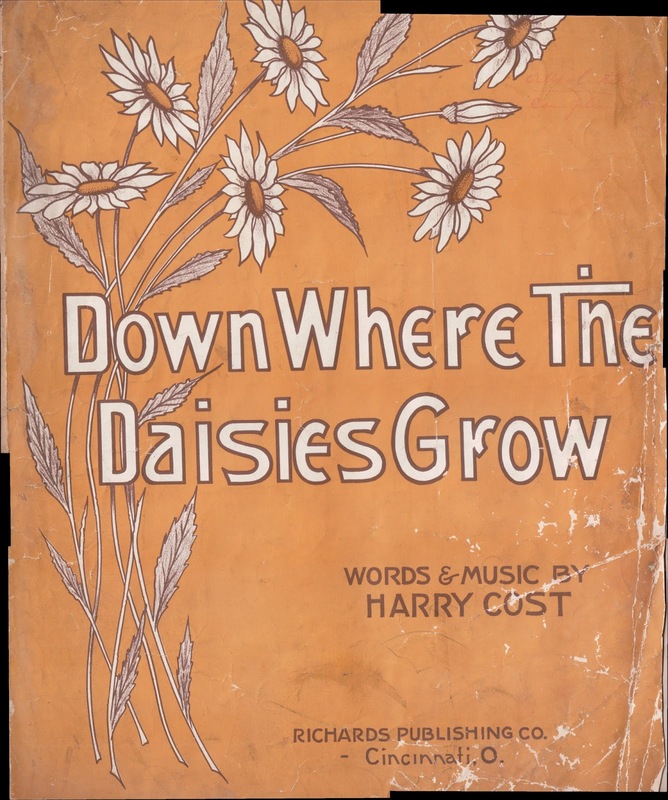 Sarah's uncle Richard Henry "Harry" Cost, Jr., wrote both music and lyrics to "Down Where The Daisies Grow." 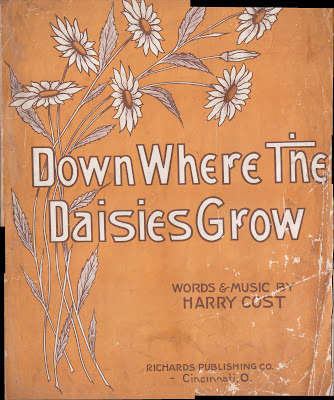 Richards Publishing Company of Cincinnati, Ohio, published the song in 1917, the year Harry turned 41 years old. Several in the family put their own words to familiar tunes, but Harry's is the only original composition I've seen in published form. 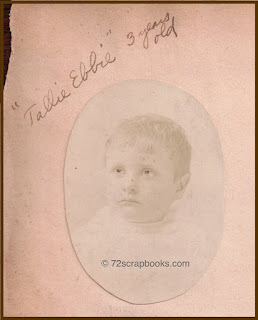 In two other blog posts, read more about the gregarious Harry and see a photo taken when he was 6 years old. 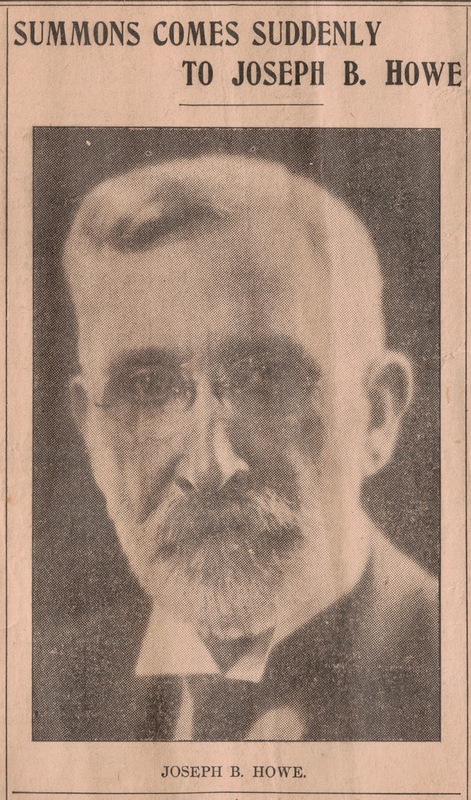 According to this clipping (source not noted), "Free Lunch Cadets" was John Philip Sousa's first published song. The copyright date, hard to read in the illustration but provided on multiple websites, is 1877. Note the sign on the wall: "Saur Krout Lunch To Day." 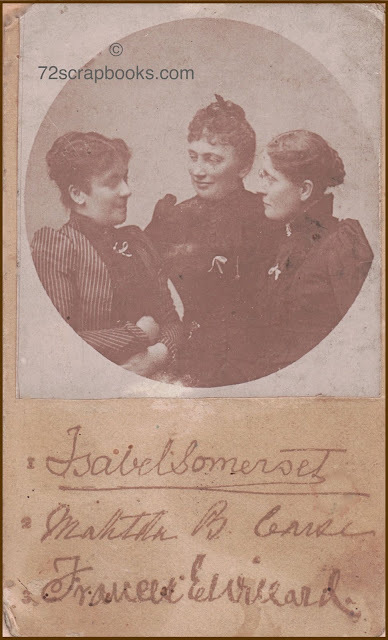 In the 1870s, German immigrants and their descendants made up a significant part of the population in Philadelphia (where the music was published) and Cincinnati (where Sarah's German-descendant Cost ancestors lived). According to online genealogy sites, more of today's Americans descend from German ancestry than from any other nationality. I wonder if the sign in the drawing is meant to be a derisive jab at German immigrants of that day? Piano sheet music for this march is available free online. The Carrollton Glee Club performance program is undated. Because of the listed performers and the pages advertising local businesses, I calculate that the event took place after1890 and before 1920. Performers in the program include Mrs. (Katherine) Boughner, Miss Coan, Mr. (T. Sanders) Orr, Miss Maxwell, Mr. (W.) Schuerman, Mr. (R.M.) Hiner, and Mr. (W.W.) Masterson. Mr. Schuerman was related to the Howes by marriage, and the rest were no doubt acquainted with the Howes through business, the Carrollton Methodist Episcopal Church, or other affiliations. An organ recital in Carrollton on March 10, 1927, featured W.E. Pilcher, Jr., representing Henry Pilcher's Sons Organ Company of Louisville. Also performing were violinist Harriett Poynter and vocalist Mrs. J. Gex Williams. 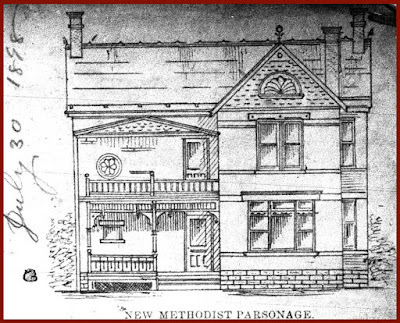 Maybe the women were members of Carrollton First Methodist Church. The history of the organ company goes back several generations to England. To paraphrase information on a website: Henry Pilcher, Sr. of Canterbury apprenticed as an organ builder in London. He arrived in New York in 1832 and established a business in New Jersey. His sons, Henry Pilcher, Jr. and William Pilcher II opened an organ building shop in St. Louis in 1852. 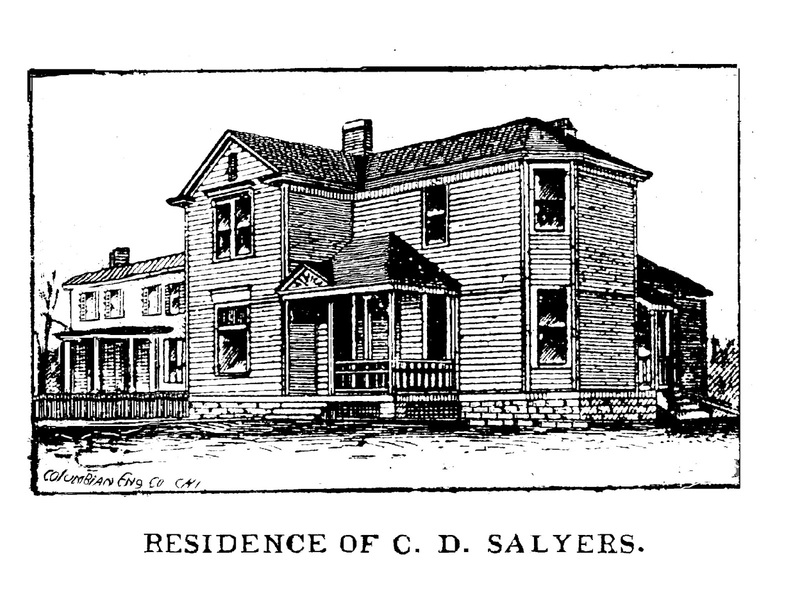 During the Civil War era, the firm relocated to Chicago. In 1874, the Pilcher firm once again moved their business to Louisville, Kentucky. The firm built more than 1,800 organs for churches, concert halls, and universities across the country. In 1944 the factory closed and the assets were sold to the M. P. Möller Organ Company of Hagerstown, Maryland. Three more sheet music covers relate either Sarah's interests in music – or maybe, being an artist herself, she appreciated the illustrations. "The Fireman's Call" is "respectfully dedicated to the Officers and Members of the Fire Department of Boston." The music is from an opera, "The Maid of Judah," written in 1832. Stephen Foster's "Jeanie With the Light Brown Hair"
has a publication date of 1854. Here in the Bluegrass State, we know Foster best as the composer of "My Old Kentucky Home." 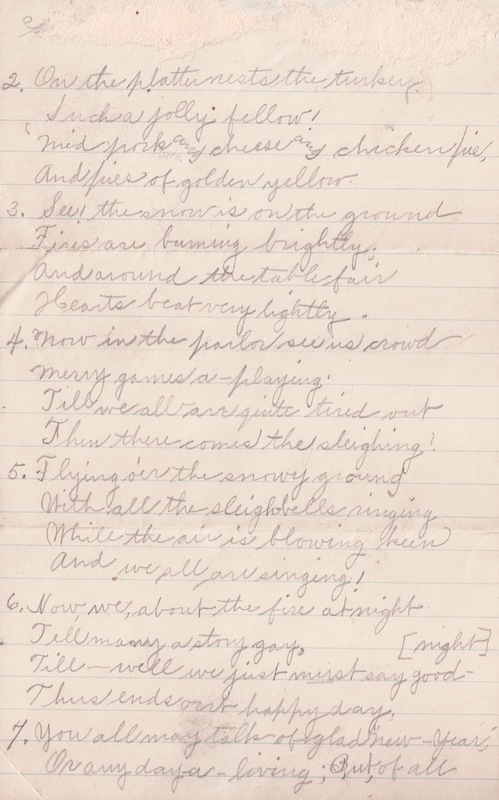 Readers of this blog won't be surprised to know that at least one of Sarah Eva Howe's relatives – an aunt by marriage – wrote a poem about Christmas. 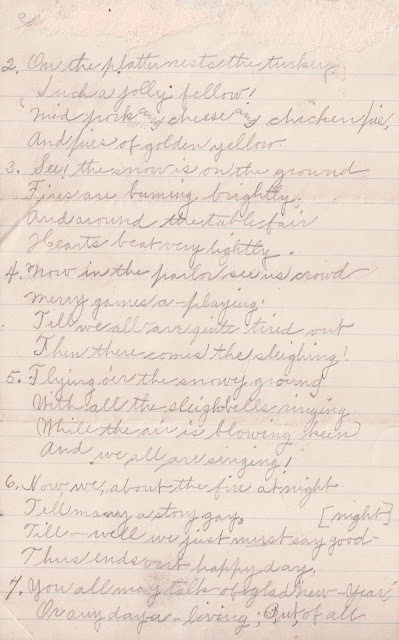 The poet was Louisiana Winslow Howe, born 27 May 1852 in Carrollton, Kentucky, to local attorney and judge William Beverly Winslow and his wife Martha Jane Woolfork Winslow. In 1873, "Lou" married one of Sarah's paternal uncles, William Ficklin Howe. 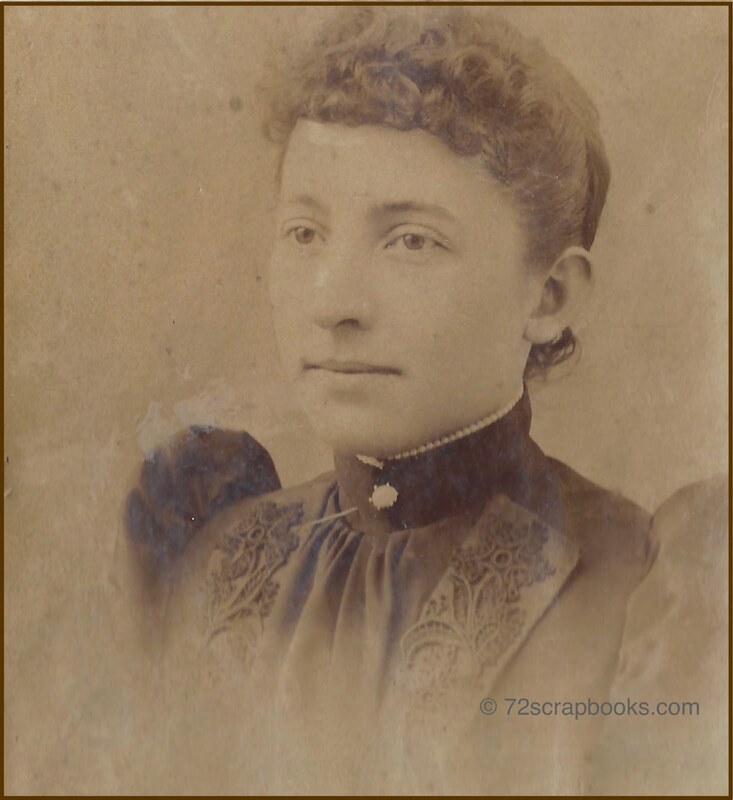 You can learn more about her and see another photo in a previous post: The Highly Accomplished Family of William Ficklin Howe. There's also a short article about her on the website Northern Kentucky Views. (Scroll to the bottom of that page.) It was written just five years before her death (1944) and details her family connection to several prominent Virginians. 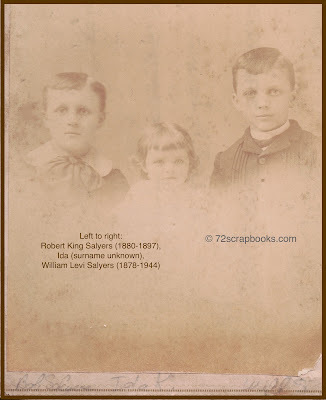 By the way, have you ever gone to AbeBooks.com and searched for writings by your ancestors? Surprises may await you there. Just this morning I found a copy of Lou's published verse, Rambling Rhymes. I ordered it and hope to have it in my hands before the year ends. But enough about Lou. It's Christmas! 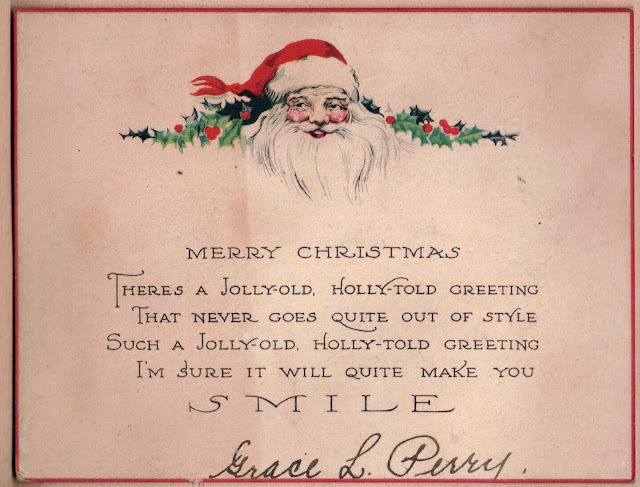 Grab some hot cider and enjoy her holiday greeting in verse. It's full of sentiment and is a pleasant read, but (dare I say it?) I think her verse pales in comparison to poems written by her niece Sarah. United with "La belle riviere,"
Through waters of the Ohio. Greetings to far-off towns I send. 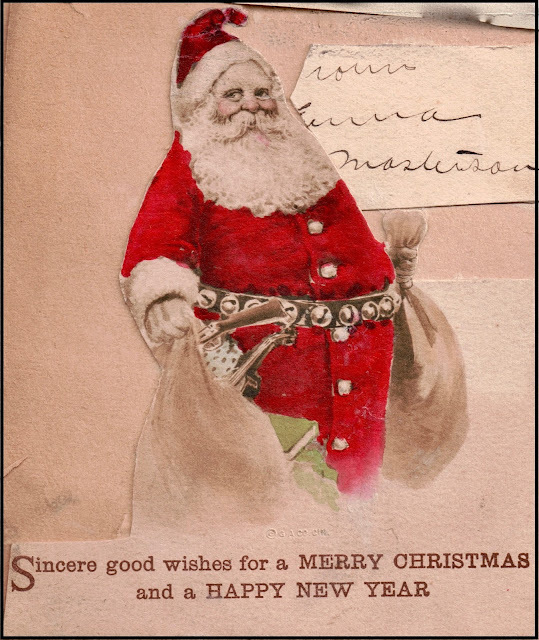 A Merry Christmas to all friends! "Glory to God, on Earth be peace,"
(To trusting souls) which ne'er shall cease. Matures in a Celestial Clime. 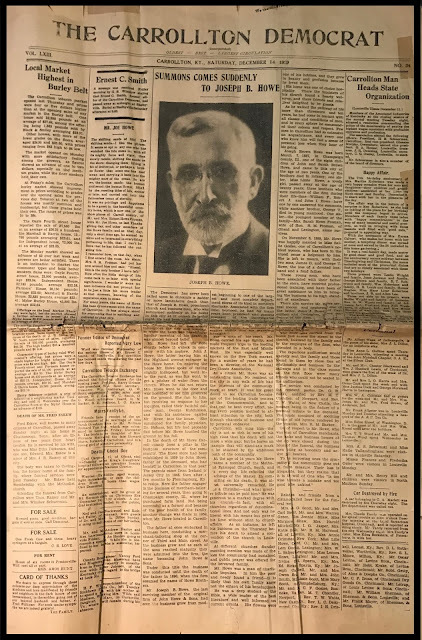 Today's post comes not from one of Sarah Eva Howe's 72 scrapbooks but from The Carrollton Democrat, which at that time was published on the Saturday of each week. 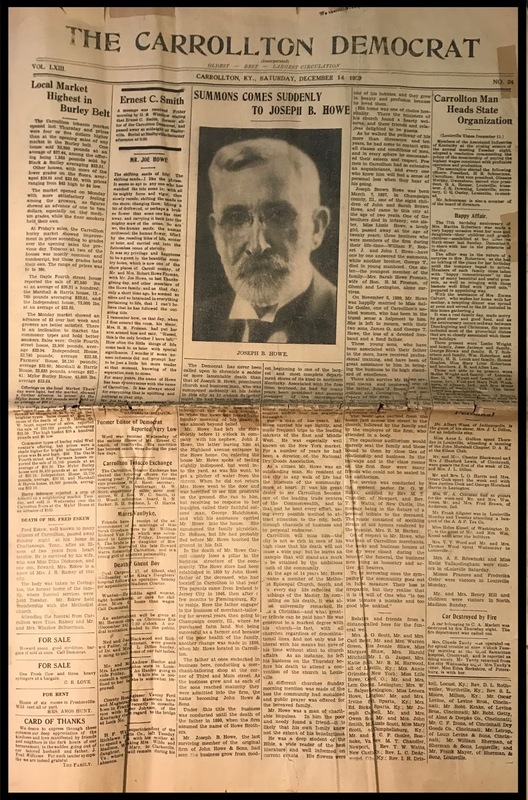 In the issue dated Dec. 14, 1929, more than half of the front page is about the sudden and unexpected death of Sarah's paternal uncle, Joseph Brown Howe. Thanks to Carolyn Williams of Carrollton, I have that entire section of the paper. 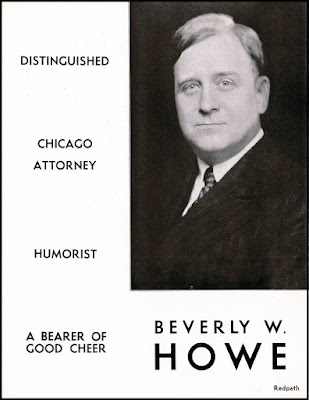 Joseph B. Howe died on Saturday, Dec. 7, 1929, one week before the Democrat announced his passing. No doubt most of the people of Carrollton, Kentucky, already knew about the death. Still, the editor considered the week-old news important enough to document it on Page 1. The photo and the story/obituary cover three of the page's six columns, and a personal tribute by Russel O. Dufour takes part of a fourth column. The Democrat has never been called upon to chronicle a sadder or more lamentable death than that of Joseph B. Howe, prominent church and business man, who was summoned suddenly at his home in this city at 11 o’clock Saturday night. 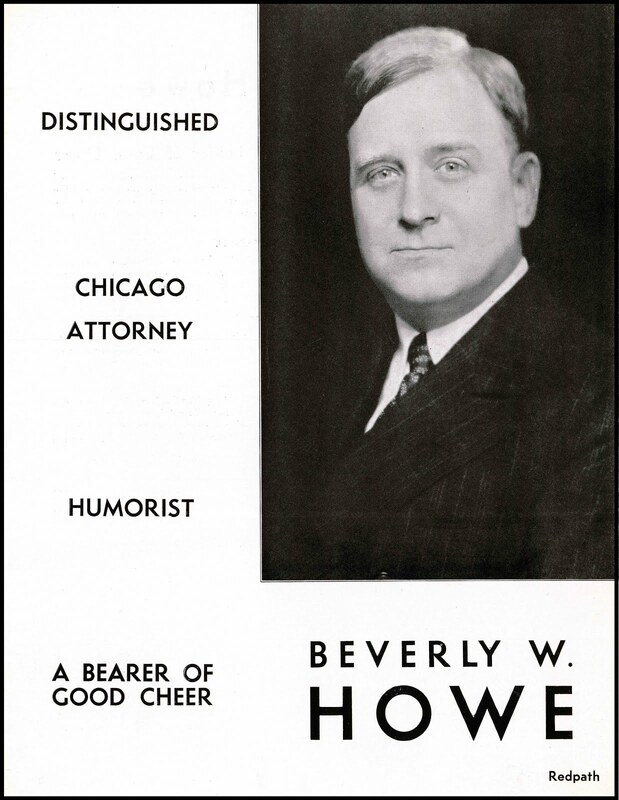 He had been at the store of Howe Brothers all day, very busy because of the approaching holiday season and in fine spirits throughout the day and evening, so when the news was heard early Sunday morning of his death it was almost beyond belief. 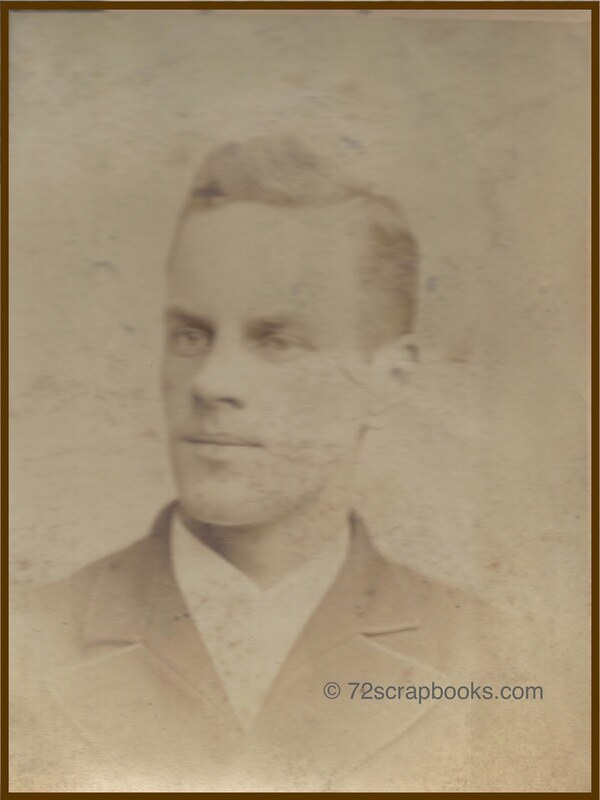 Mr. Howe had left the store shortly before 11 o’clock in company with his nephew, John J. Howe, the latter leaving him at the Highland avenue entrance to the Howe home. On entering the house Mr. Howe spoke of feeling slightly indisposed, but went into the yard, as was his wont, to get a pitcher of water from the cistern. When he did not return Mrs. Howe went to the door and was horrified to see him prostrate on the ground. ... She summoned the family physician, Dr. Holmes, but life had probably fled before Mr. Howe touched the ground in his fall. Mr. Joseph B. Howe, the last surviving member of the original firm of John Howe & Sons, had seen the business grow from modest beginning to one of the largest and most complete department stores of its kind in northern Kentucky. 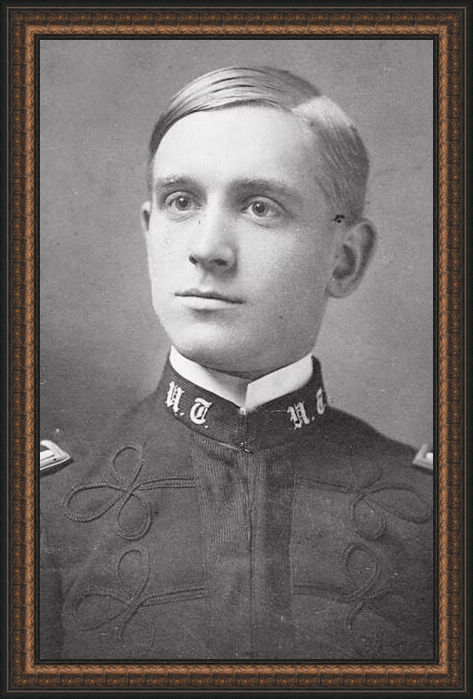 Associated with the firm from boyhood, he had for many years been president and general manager of the incorporated company, and in great measure the success that has attended the enterprise has been due to his sound judgment, his splendid executive ability and his sagacious foresight. For a man of his years, Mr. Howe carried his age lightly and made frequent trips to the leading markets of the East and Middle West. He was especially well known on the New York market. For a number of years he had been a director of the National Dry Goods Association. As a citizen Mr. Howe was an outstanding man. No resident of the city in any walk of life had the interests of the community more at heart. It was his great desire to see Carrollton become one of the leading trade centers of the Commonwealth, and to that end he bent every effort, using every possible method to attract attention to the city, both through channels of business and by personal endeavor. Carrollton will miss him — the city is not so rich in men of his high class that his death will not cause a wide gap; but he leaves an example that will stand as a mark to be attained by the ambitious youth of the community. Mr. Howe was a man of charitable impulses. In him the poor and needy found a friend — it is likely that his own family knew not the extent of his benefactions. He was a deep student of the Bible, a wide reader of the best literature and well informed on current events. His flowers were one of his hobbies, and they grew in beauty and profusion because he loved them. His home was one of choice hospitality. There the ministers of his church found a hearty welcome, and there friends and relatives delighted to be guests.
. . . Joseph Brown Howe was born March 7, 1857, in Champaign County Ill., one of the eight children of John and Sarah Brown Howe, and came to this city at the age of two years. 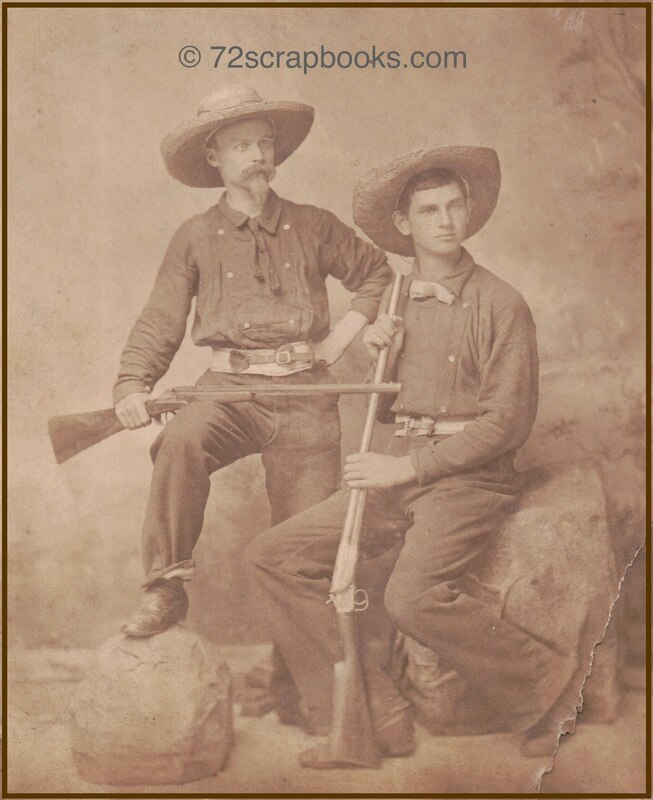 One of [his] brothers died in infancy; one sister, Miss Lizzie Howe, a lovely girl, passed away at the age of twenty years; three brothers who were members of the firm during their life-time — William F., Robert J. and John I. Howe — have one by one answered the summon, while another brother, George T., died in young manhood. One sister — the youngest member of the family — Mrs. Sarah Howe Froman, wife of Hon. H.M. Froman, of Ghent and Lexington, alone survives. 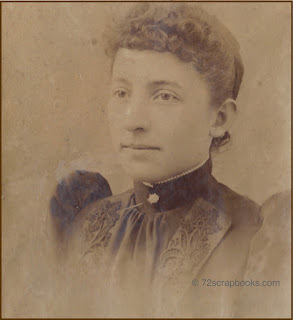 On November 6, 1889, Mr. Howe was happily married to Miss Sallie Goslee, one of Carrollton’s noblest women, who has been in the truest sense a helpmeet to him. 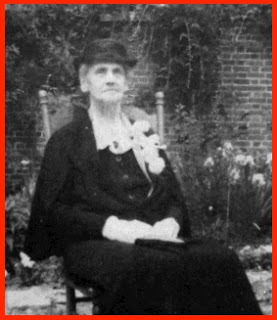 She is left to mourn, with their two sons, James G. and George T. Howe, the loss of a devoted husband and a fond father. ... There also survive Mr. Howe several nieces and nephews, one of the latter, John J. Howe, of Carrollton and Covington, being secretary of the firm. 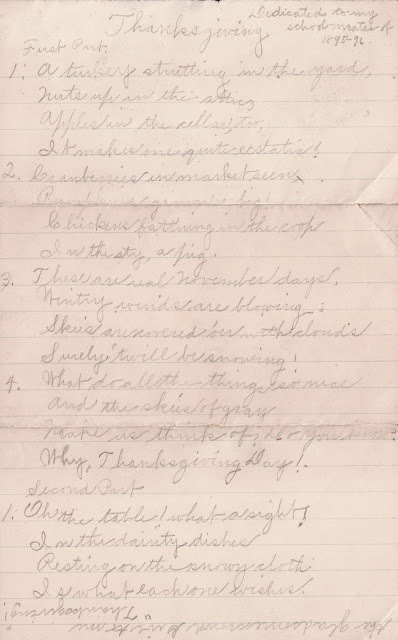 At two o-clock Tuesday afternoon [Dec. 10, 1929] the last rites were held at the Methodist church. ... 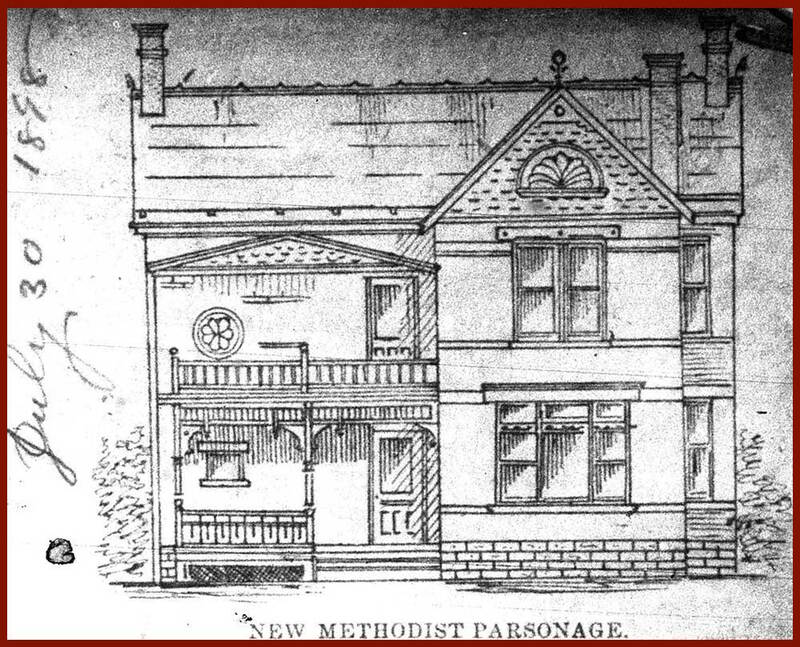 The body was carried from [the Howe home] just across the street to the church, followed by the family and by the employees of the firm, who attended in a body. The capacious auditorium would scarcely seat the family and those bound to them by close ties of relationship and business. In the hallways and in the class rooms on the first floor were many friends who could not be seated in the auditorium. The service was conducted by the resident pastor, Dr. G.W. Banks, assisted by Rev. N.T. Chandler, of Newport, and Rev. T.W. Watts, of New Castle. ... 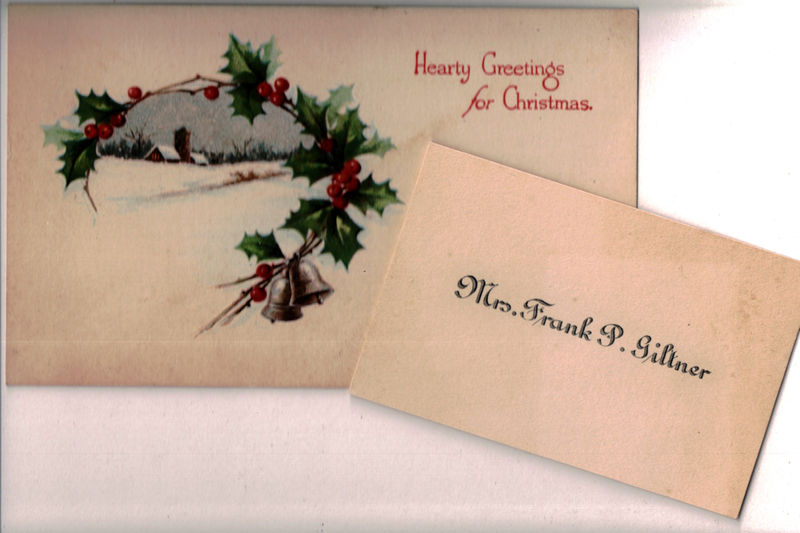 The music consisted of soothing strains of old hymns rendered by the organist, Mrs. R.M. Barker. Mrs. Jas. G. Scott, Mr. and Mrs. Carl Becker, Mr. and Mrs. Warren Green, Miss Jennie Shaw, Miss Margaret Shaw, Mrs. Harold Mitchell, Mr. I.G. Jasper, Mrs. Katie Smith, Mr. B.M. 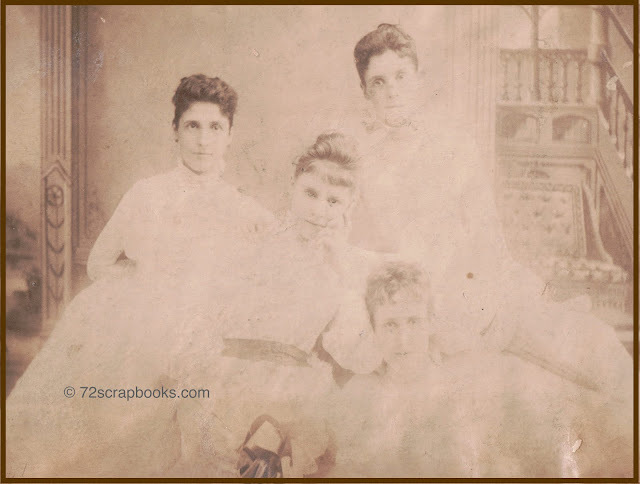 Harwood, all of Louisville, Ky.; Mrs. Annie Grimstead, New York; Miss Lillie Howe, Oxford, O.; Mr. and Mrs. Lem Gooding, Lexington; Mrs. W. L. Salyers, Lexington; Miss Lenora Howe, Lexington; Mr. and Mrs. Irvine Scott, Sparta, Ky.; Mrs. Ed. Bickers, Sparta, Ky.; Mrs. Joseph Campbell, Mr. and Mrs. Owen Scott, Mr. and Mrs. John Smith, Miss Lizzie Scott, Miss Mary Scott, of Campbellsburg, Ky.; Mr. and Mrs. C.F. Goslee, Roanoke, Va.; Rev. M.T. Chandler, Newport, Ky.; Rev. T.W. Watts, New Castle, Ky.; Rev. L.C. DeArmond, Ghent, Ky.; Rev. I.H. Driskell, Locust, Ky.; Rev. D.L. Rothweiler, Worthville, Ky.; Rev. S.L. Moore, Milton, Ky.; Mr. Oscar Levine, of Levine Bros., Cincinnati; Mr. Robt. Krake, of Levine Bros., Cincinnati; Mr. Robt Getty, of Alms & Doepke Co., Cincinnati; Mr. C.F. Irons, of Cincinnati Dry Goods Co., Cincinnati; Mr. Leirup, of Louis Levine & Sons, Cincinnati; Mr. William Sherman, of Sherman & Sons, Louisville; and Mr. Frank Mayer, of Sherman & Sons, Louisville. The shifting sands of life! The shifting sands — I like the phrase. It seems so apt to any one who has watched the tide come in; with all its mighty force and vigor, then slowly recede; shifting the sands on the shore; changing them; lifting a bit of driftwood, or perhaps a broken flower that some one has cast away, and carrying it back into the mighty maw of the ocean. So are we, the human sands; the human driftwood; the human flower, lifted by the receding tides of life, sooner or later, and carried out into the fathomless ocean of eternity. 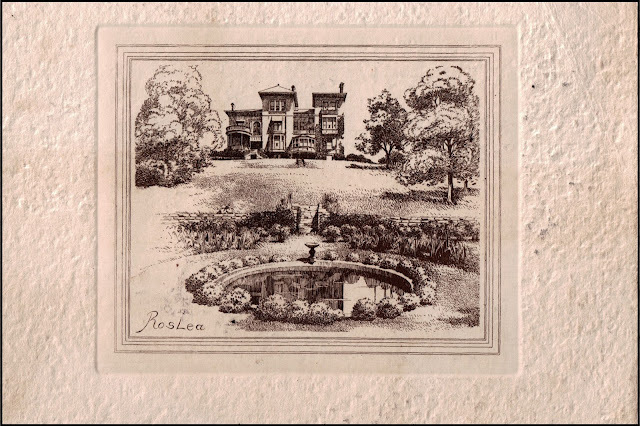 It was my privilege and happiness to be a guest in the beautiful country home, which is now one of the show places of Carroll county, of Mr. and Mrs. Robert Howe Froman, with Mr. Joe Howe, on last Thanksgiving day, and other members of the Howe family; and on that day, only a short time ago, he seemed so alive and so interested in everything pertaining to life, that I can’t believe that he has followed the outgoing tide. I remember how, on that day, when I first entered the room, his sister, Mrs. H.M. Froman [Sarah Varena Howe Froman, Joseph's only surviving sibling], had put her arm around him and said: “Russel, this is the only brother I have left!” How often the little things of life come back to us later with special significance. I wonder if some unseen influence did not prompt her to be just a little bit more tended at that moment, knowing of the separation soon to come. For many years, the name of Howe has been synonymous with the name of Carrollton. It has always stood for everything that is uplifting and cultural in that city. Mr. Joe Howe was a gentleman of the old school, a fine, upstanding man, and his passing means a great loss to the community. 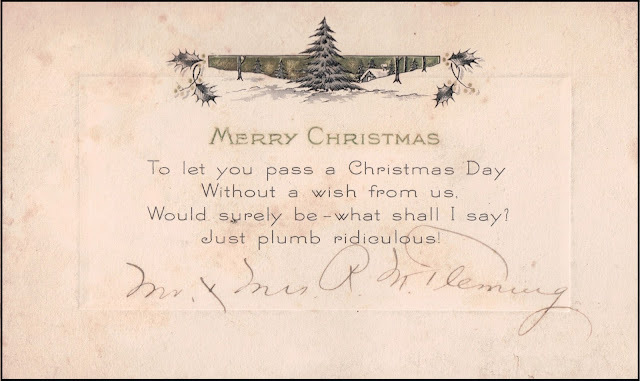 Christmas Cards to the Howe Family of Carrollton, Kentucky – 1882 to 1920. Merry Christmas! After a rash of technical difficulties followed by seasonal busy-ness, I'm back into the 72 scrapbooks of Sarah Eva Howe. 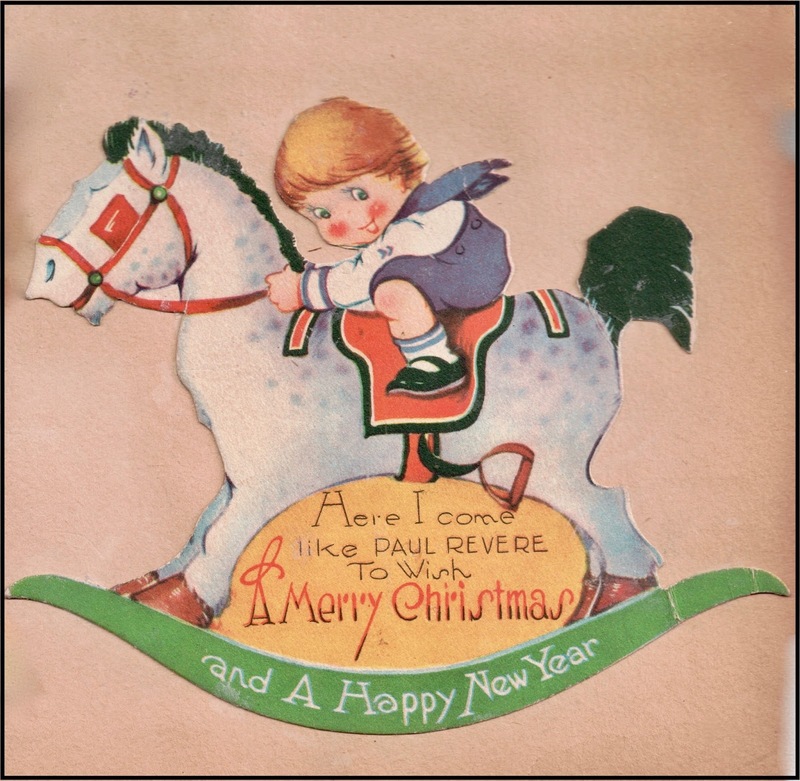 Today we look at a few of the Christmas cards Sarah pasted into her earliest scrapbooks. 1. 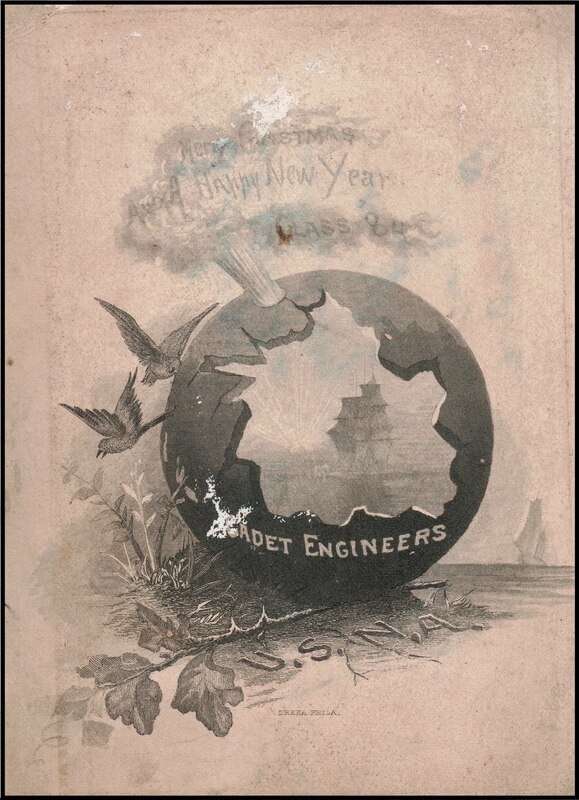 Possibly the earliest Christmas card in the collection – and the most unusual – is this one from the Cadet Engineers of the U.S. Naval Academy, Class of 1882. The holiday greeting doubled as an invitation to a ball and several "hops" scheduled throughout 1882, so this card likely was mailed in time for Christmas 1881. I wish I knew who sent it and which Howe family member received it. 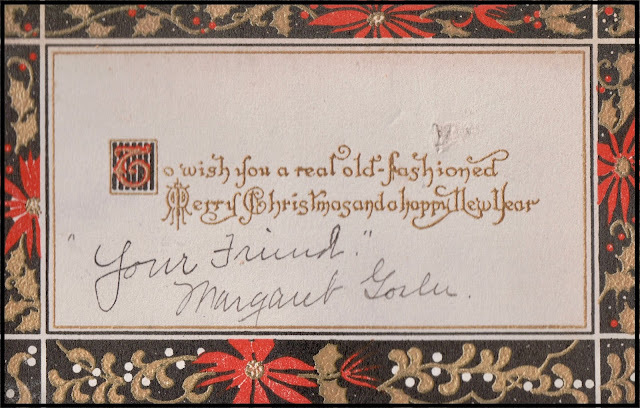 Sarah wasn't yet born, so it could have been addressed to someone in her parents' generation. 3. The front of this card presents a drawing of an impressive home, with RosLea (the name of the estate?) written in one corner of the image. 4. Grace L. Perry sent the Howes a Santa-themed card. 5. This card arrived at the Howe house from Mrs. Frank P. Giltner, who was indirectly related to the man who later became Sarah's husband. 6. 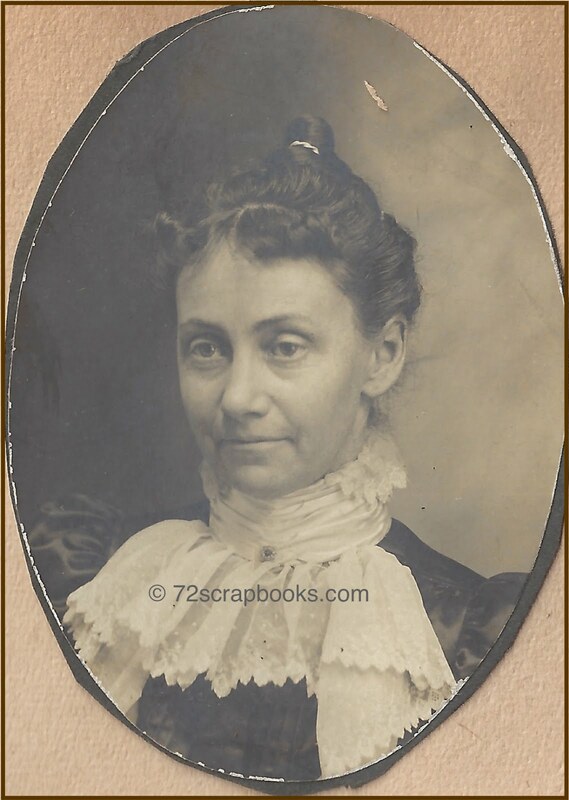 Margaret Goslee was probably related to Sallie Goslee, who married Sarah's uncle Joseph Brown Howe in Carrollton in 1889. 7. Based on the "hope you are well" phrase they wrote on their card, I assume that Mr. and Mrs. P. J. Clark lived someplace other than Carrollton and did not see the Howes often. 8 & 9. 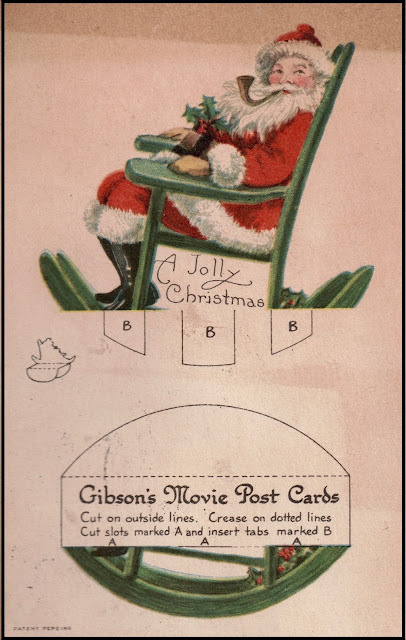 A few cards, like these two with Santas, were geared to children. The first is from Emma Masterson. The second, after some cutting and assembly, becomes a toy. 10. Last but not least is this charmer, which I found in a scrapbook compiled by grown-up Sarah Eva Howe Salyers for the youngest of her four children. That child, David Hillis Salyers II, probably received this card circa 1918, when he was about 3 years old. 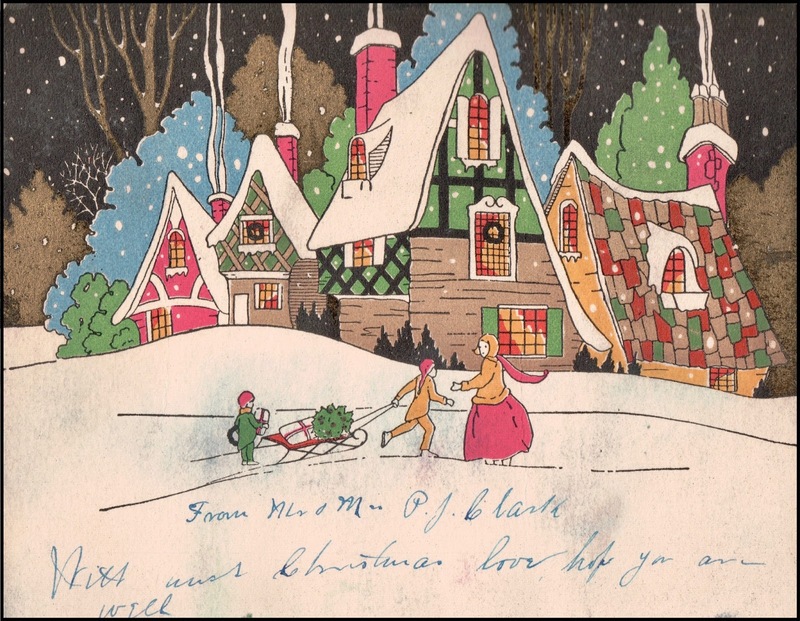 I enjoyed gathering these holiday images and getting a sense of Christmas customs during Sarah's youth and young-adulthood. I hope they brought you some holiday cheer, too.